The first item I installed was the sub frame bushings. As some of you may know the first and second generation f-body’s came with a removable front sub frame. The car was a sort of hybrid uni-body. The front sub frame is held in with four body mounts and two that attach to the radiator core support. Here’s the kit from DS&E. The bushing in the center is for the radiator core support the other two are the body mounts. The new ones are made of aluminum and are hard coated. They came with stainless steel washers. Here’s a side by side with the old polyurethane bushings. I never drove the car with the original rubber sub frame bushings, so I can’t really tell you how the new ones compare. 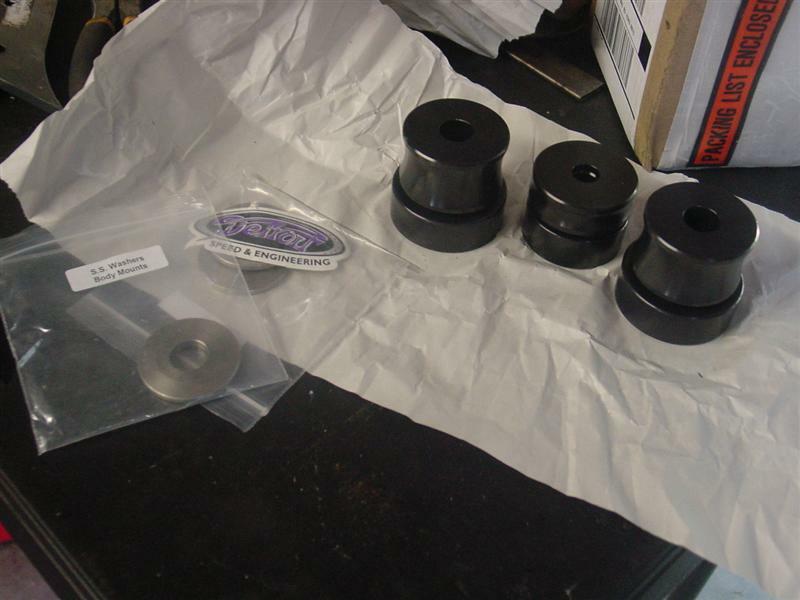 I was hesitant to switch to solid aluminum bushings fearing that solid bushing would destroy the ride quality, but it did not change at all from the poly bushings. The main reason I went to aluminum bushings is that when you add weld in SFC’s there can not be any flexing in the front sub frame, the flex caused by rubber bushings would put stress on the welds connecting the SFC to the sub frame and likely cause the weld to fail over time. To install them I loosened all the bolts on one side of the sub frame, and then used a pry bar to help lower the sub frame a little bit, I then repeated the same procedure on the other side. By installing one side at a time I was able to keep the front subframe aligned. The four body bolts were torqued to 80 ft/lbs the fronts to 35 ft/lbs. This is the rear bushings installed. You’ll probably notice I don’t have grade eight bolts for these. I needed longer bolts for the new bushings and Home Depot did not have the size I needed (3/4″ x 3 3/4″) in grade eight. I’ll replace them with better one as soon as I can find them. For the fronts I was able to find the proper bolts, here they are installed. Before I started the SFC install I made sure that the front sub frame was aligned properly with the rear. This is critical, because as you can probably guess if the front sub frame is out of alignment it will be locked in place when you weld in the SFC’s. The GM service manual I have outlines the whole procedure. Basically there are some alignment holes on the front sub frame and on the rear frame rails (which can be seen later on in some picture). With the car level you string a plum bob from the center of these holes and measure diagonally. The two measurements were off by less than a 1/16″, which corresponds to what the alignment guy told me when it was aligned. After disconnecting the battery, ignition system, and fuel/brake lines I started tearing apart the interior. First to go was the front seats, they are held in with four 1/2″ bolts each. Then the rear seat, the bottom comes out by forcing your knee up against the front part of it to unhook from the floor. The seat back comes out by simply pulling it up. Next out is the rear carpet section; this comes out by loosening the sill plates and a bolt at the end of the center console, which is hidden under the ash tray. The old asphalt sound deadening is the next thing to come out. This is why people in the north hate us southerners. 36 years old and the floor boards are solid as a rock. This type of connector is installed by cutting a slot into the floor pan through which the connector is slid, this is how the connectors are able to maintain such high ground clearance. Templates for all the cuts are provided by DS&E. The template is placed on the underside of the car. Using magnets to help hold up the template is a big help. The template it located using the rear edge of the front sub frame and the pinch weld by the rocker panel. I originally used dykem blue and a scribe to transfer the lines onto the sheet metal. However, because the bottom of the car was painted black the scribed line did not show up very well. I traced over the line with a yellow paint pen. Next a section of the seat riser must be cut to gain access to one of the joints that needs welding, again a template is provided and is located using two of the seat bolts. Here the seat riser has been cut and the floor pan has been partially cut. There are also two spot welds that need to be drilled out. All the cuts have been made. The exact same procedure is repeated on the other side with the same template. Now every install is not complete with out an unforeseen obstacle. Mine came in the form of a crushed rear frame rail. This is most likely due to improper jacking technique by a previous owner. I discovered that after my initial cut there was another piece of sheet metal between me and the frame. I used a pneumatic body saw to cut the inner piece of sheet metal. This allowed me to fit a 1/2″ extension through the cut and pop the indentation out. Here you can see that the fit it much better then before. Now that that problem has been solved we can move on to preparing the SFC’s. First they have to be dry fit and cut to length. I cut them so that there was about 1/2″ in-between the edge of the connector and front sub frame. Next an end cap in welded on to seal the end. I welded along the under side of the connector too, welding one inch at a time and switching sides to minimize distortion. The access panel is welded back in place and ground smooth. The flap I cut to get to the back of the rear frame rail was also welded back up. The last thing to do is reinstall the drain plugs with some seam sealer and put the interior back together. Your inferior bolts are insulting. Seeing as how this was originally written about 6 years ago I think it will be fine. Although I will probably upgrade them when we swap the engine out.